Michael Pratt is a storyteller. A pet storyteller if you will, whose life amongst the ‘counter culture’ of inner city Portland, USA, has lead him down an impressive artistic path. 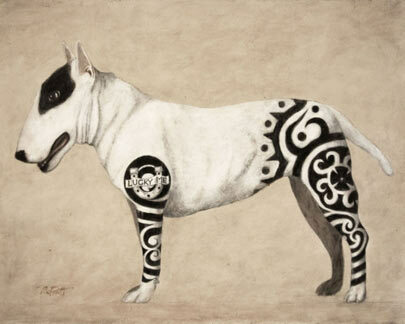 Inspired by the likes of Donald Roller Wilson and John Singer Sargent (amongst others), Pratt’s most recent works include his Tattoo’d Dogs series, where painted mutts tell tales through body art. Born and raised in Roswell, New Mexico (that’s right, the Roswell), Pratt now resides with his wife in Portland, Oregon with “two rescue cats that have control issues”. Their beloved toy poodle Kirby (AKA Benito Poodlini) passed away recently, but the “big and stocky with an attitude” pet was definitely the kind you could imagine gracing Pratt’s canvasses. Each dog has a name and a story to tell (like Lucy, who ‘had that street dog flair about her’ and ‘had been around the block a few times’) and some even have a sci-fi bent to them, although this is not necessarily a nod to the mysterious Roswell/UFO brewhaha. The reaction from the public has been an eye opener for Pratt, who has enjoyed observing their interest in the convergence of cultures — passionate or not. “It has raised my awareness of how people relate to their pets, and to art that suggests they see them in a different light” he observes. For now Pratt will continue to work on the Tattoo’d Dogs series, as well as other related projects; continuing to enhance and develop the works to new and different levels. We look forward to seeing what’s next. Upon first encountering the works of Nadin Maria Rüfenacht, the viewer is sure to feel at a loss for words and at times a little uncomfortable. Set against a murky black background, the eerie, David Lynch-like works are a triumph to behold, at the very least due to the overwhelming sense of awe felt at first sight. With Nature Morte, Rüfenacht wanted viewers to remain open, even ‘irritated’ at times, urging them to look deeper both at the images and at themselves. Nature Morte translates literally to ‘still life’ but don’t start conjuring pictures of stylised fruit. Well OK, there is fruit but rather than artfully arranged in a bowl, grapes, pears and pomegranates are carefully placed on painstakingly draped cloths surrounded by monkeys, horses heads and of course dogs. Rüfenacht’s own whippets Titus and Xavoo to be precise. Born in Burgdorf, Switzerland; Rüfenacht grew up with her ‘hippie’ parents and a lot of animals in the countryside, and this has informed her life as an artist as she develops her works with objects and animals she knows inside and out. After time spent experimenting with black and white images in the photo lab throughout high school, Rüfenacht moved to Leipzig to study the craft full time. Over the years, she grew weary of finding visuals in reality, and began ‘to build a stage’ in order to do the work she envisioned in her mind. Nature Morte was shaped around the concept of heros — what they are and what they look like. Placing Titus and Xavoo in stylised scenarios allows them to be viewed in an entirely new way to how they really are. Rüfenacht is fascinated by how and why particular photographs and paintings resonate with a viewer. 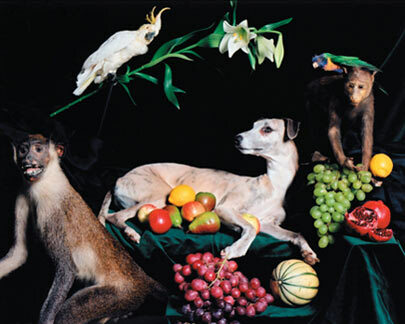 Nature Morte references many artistic notions, from Renaissance to Baroque to Surrealism to discover what she does and does not like, learning along the way how “to create new meanings and other or new possibilities to interpret.” She chose her whippets as they are “very quiet inside and have a lot of energy outside”, making them the ideal subjects for Nature Morte and its staged reality concept. Currently pregnant with her third child, and having recently shown at Galerie Brunner in Bern, Rüfenacht’s next project is “really big collages” of her own photographs, again utilising animals in surrealist situations — viewers beware.